Contrary to popular belief, it does rain in Southern California. 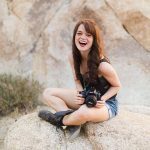 As California photographers, we may be less equipped than photographers in other regions. But never fear! Perhaps the venue is outdoors, without an indoor backup plan. We expect the sunshine, but as any wedding photographer knows, wedding days never go exactly according to plan. Here are some tips (from personal experience) that can help on a rainy day. The last thing any bride wants on her wedding day is rain. The best thing you can do as a photographer is stay calm, and be a calming presence to the bride and the rest of the wedding party. 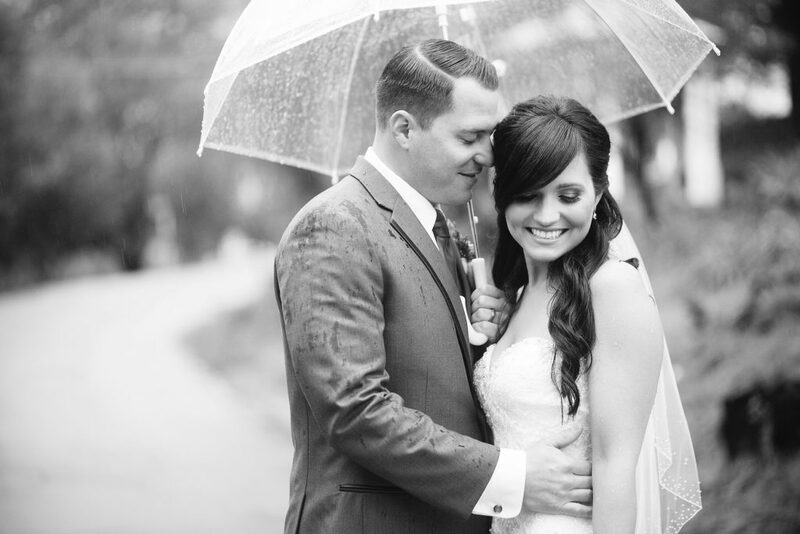 This rain isn’t going to ruin the wedding—hey, rain on the wedding day is good luck! Stay positive and assure the bride that everything is happening just as it should, and that you’ve got everything under control—because you do. 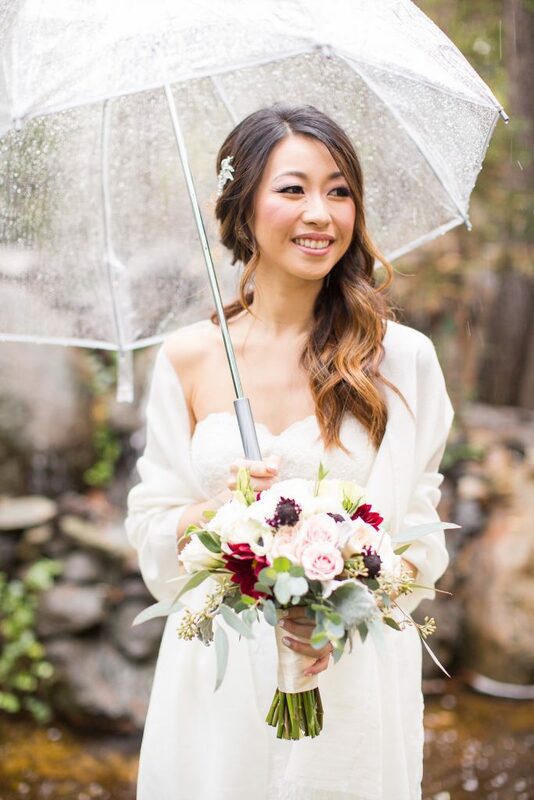 The rain presents a unique opportunity for gorgeous rainy day portraits! Take full advantage of what mother nature has presented you with and embrace the drizzle (or deluge, whatever you end up with). I like to keep cute umbrellas in the back of my car for times like these—set the bride and groom up under them and pose them for some creative portraits! Have the groom lead the bride through the rain, keeping her safe and dry. 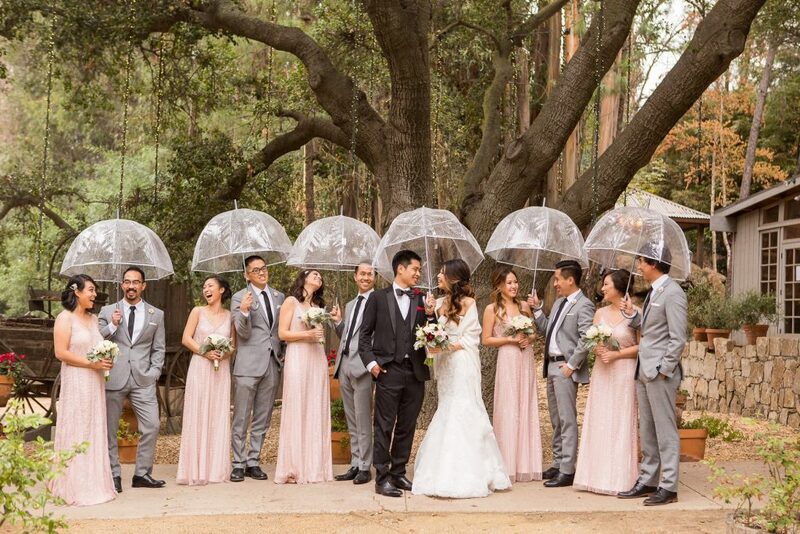 Don’t just bring umbrellas for the bride and groom- bring some for yourself too! When I’m working alone I have a black collapsible umbrella that I use. When I have an assistant, I may ask him or her to hold a larger golf umbrella for me so I’m freer to move and more covered. As for your gear, I recommend having a rain guard or other waterproofing shell for your camera. However, not all of us experience rain often enough to want to invest in one (I’m guilty of this). So, if you’re caught without a rain guard, you can fashion one out of anything nearby. I’ve used plastic grocery bags, Ziploc bags, hotel ice machine bags, trash bags… anything to keep the gear dry! It’s not the most attractive looking, but hey, it works! We have to accept and embrace what we can’t control in life. You can either let it hold you back or propel you forward. So, on a rainy day, make the best of it! Enjoy it! I was second photographing a wedding in Ventura, California. Right before the ceremony, it started to pour buckets. It was an outdoor ceremony, and the bride and groom opted to keep it outdoors. The lead photographer and I stood in the rain getting drenched as the bride and groom did the same at the altar. Once we accepted our fate as wet, soggy photographers, and saw the joy on the couples’ faces despite the rain, we couldn’t help but smile, laugh, and enjoy the crazy moment! It’s not everyday that you’re standing in pouring rain overlooking the ocean, photographing two people so completely in love that they don’t seem to notice the rain. All photos courtesy of Katrina Jayne.